And yet, the human rights component in UN peace missions has played a significant role in maintaining and building peace in the regions they supervised. This component has prevented and redressed human rights violations by monitoring the human rights situation, issuing public reports, and assisting in building national capacities to address human rights issues. 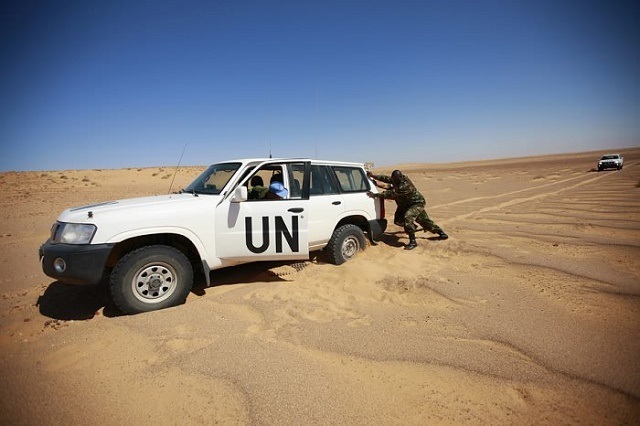 In 1991, when the UN brokered a ceasefire between the kingdom of Morocco and the Polisario Front, bringing to an end the 16-year war and paving the way for a peaceful outcome to the long running conflict, the two parties had to sign a peace agreement without a specific deadline for hold a UN-sponsored referendum allowing the people of Western Sahara to decide their own fate. Instead, the “Mission des Nations Unis pour le Referendum au Sahara Occidental” known as MINURSO set up its offices, spread its blue helmet forces with the promise of holding a referendum yet, as very few people noticed, was exempt from having any human rights monitoring component in this remit. Unlike UN peacekeeping missions limited to a ceasefire-monitoring task – such as those between Lebanon and Israel, or between the south and north of Cyprus – in which the dispatching of the blue helmets was to supervise and report on the opposing troops’ commitment to peace, the main objective of MINURSO, from the outset, was to organise a fair and democratic referendum in which the people of Western Sahara are able to cast their votes on either independence from or integration into the kingdom of Morocco. Meanwhile, both opposing parties have engaged in direct and indirect negotiations to pave the way for the proposed referendum, and some high-profile UN Secretary General special envoys to the region have made genuine efforts towards securing a lasting solution. Nevertheless, the dispute has remained locked in a stalemate, leading to unprecedented frustration among the Saharawi people, whose voices on the political scene have continued to grow louder in calling for the long awaited scheduled plebiscite. A wave of protest has spread like fire across the completely closed territory, despite being shut off from all forms of media and press, and has been forcefully banned, leading to flagrant, serious, and systemic human rights abuses. Human Rights Watch, Amnesty International, RFK Center for justice and human rights and other human rights groups have all highlighted ongoing severe repression in Western Sahara. Even the US State Department’s annual report on human rights acknowledges “limitations on the freedom of speech, press, assembly, and association” and “the use of arbitrary and prolonged detention to quell dissent.” Observing that support for self-determination is ruthlessly suppressed, the report goes on to note that security forces have “engaged in torture, beatings, and other mistreatment of detainees” with impunity. The threat to human rights posed by the remarkable and growing scale of violations is of increasing concern. Thus, I would like to present four key reasons why a human rights-monitoring component should, as an urgent need, be part of the MINURSO mission to Western Sahara. 1- The ubiquity of the monitoring: The MINURSO human rights component would apply not only in the zone occupied by Morocco, but also the strip liberated by the Polisario Front, in addition to the refugee camps based south of Algeria. The remit of the MINURSO human rights component will cover the entire region and thus, when confronted by the reciprocal accusations by both parties of human rights violations, a mandate for human rights for MINURSO would allow it to serve as an impartial and reliable reference in monitoring and reporting facts on the ground. 2- The political bias of Morocco’s HR organisations: As the international community, and the major human rights organizations, have damned its record on human rights violations in Western Sahara, the Moroccan state decreed the establishment of its own human rights body to supervise and report on the ongoing abuses. 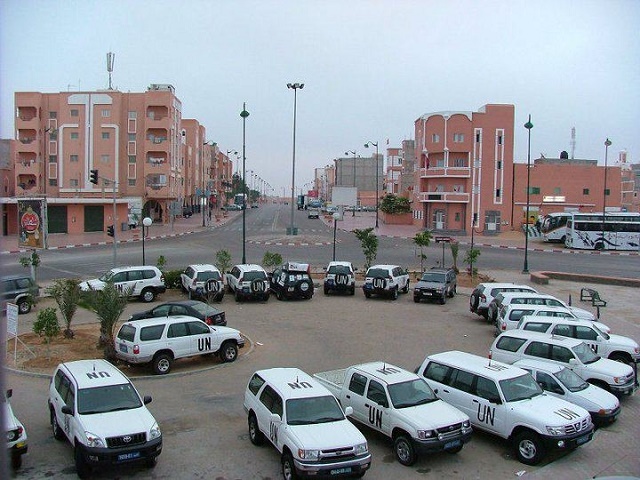 Thus, the “National Council for Human Rights” (CNDH) has been set up with offices in Western Sahara’s major cities. However, the deployment of its members was based, as usual, on their loyalty to the Moroccan monarchy, and the tasks they’ve been assigned are often usurped by the entourage of higher-level state officials. In effect, Morocco’s move is no more than a political maneuver aimed at hampering MINURSO from adopting a human rights prerogative in its coming mandate. 3- Breaking the cycle of abuse and impunity: The failure to review and address the numerous, ongoing, and specific cases of human rights abuses is a clear indicator of a culture of impunity, where the perpetrators continue fostering more abuses and the victims bitterly feel their voices being ignored. The urgent introduction of a human rights component will address these legal incongruities and help in promoting and adhering to the rule of law. Otherwise, this situation will only continue to aggravate and escalate. 4- Empowering local NGOs: Although a number of local human rights organisations have gained accreditation by the major international human rights groups, as is the case for CODESA (presided by leading Sahrawi activist Aminatou Haidar), and other similar organisations, the Moroccan state still denies them legal status and permissions to operate. As such, their members are subject to daily harassment. Equally important, despite the recent emergence of numerous local organisations involved in the protection of children’s rights, women’s rights, and the rights of people with disabilities, they have been marginalized, denied legal recognition and often brutally repressed, all because because they advocate for the right of the people of Western Sahara to self-determination. After years of occupation and human rights abuses, and in the context of endless delays in the decades-long wait for a referendum, the need for the MINURSO mandate to include within its remit a human rights-monitoring remains as pressing as ever. Such an expansion of the mandate would help empower Sahrawis to fight for their own rights, and strengthen these local capacities for resistance. Never , using “ human rights“ for political objectives or morocco will simply cancel the minurso , the sahara is moroccan and it is FINAL, the solution is waiting for a regime and mentality change in algeria ( read the wikileaks about what bouteflika said , explaining to an us ambassador what he doesn`t say to the press). And if you really live in the region Mr Khalil , you should know that no other country would be so tolerant with tenagers or unemployed low skilled young men in their early twenties breaking private cars and throwing stones , if morocco under the rule mohamed 6 really wanted to abuse human rights i can assure you they wouldn`t dare go to the streets ( hasan 2 was doing that ) if i was in charge it would be jail directly , but don`t think the country will tolerate that for a long period , it is only strategic , for now ( you know it i guess). 1988 , oil prices falllll , two months later algeria agrees to create the maghreb union with 5 members ( no membership to fictive sahara republic they created`: they had refused thousands of times before a maghreb without fictive sahara but no oil= no money to continue lobby and continue buying arms because they have nothing else). Western Sahara has never And Will never be Moroccan unless the saharauis want Italia to be. Moroccans should take into consideración that the world si not going to tolerante their abuses Against women and civilians. Moroccan feudal King And his hand-kising agents are denying freedom to the saharawis And their own people. Freedom for Western Sahara Will inevitably bring freedom for the sufred Moroccan people And the end of mohamed dictatorship! Morocco is Against the right of the saharawis to selfdetermination. Morocco is also Against the saharawis right to safety And protection. In absence of a real process that gives the saharawis a chance to decide their polítical futuro, they deserve a human rights mechanism to protect them from Moroccan police, military And thuggs! I have good friends in the Sahara and I wish for all of them the freedom and justice they deserve. I spend quite some time with them in the Sahara desert. I had there a wonderfull times and many, many good memories, but also seen troubeling events where innocent youngsters died and even got murdered. Police and military forces closed down complete cities and attack neighbourhoods. These events rarely made it to public eyes or news. That situation should end as soon as possible. I hope the Saharawi people find a way to get a fair referendum and will vote for there own governemnt and country. I think your voice can help the Saharawi people a lot. Keep writing about the Maroccan occupation, struggle for freedom and make the Sahara a better place! Another reason is that some international body should put an end to the violence of Moroccan gangs of thuggs acting no behalf of a blood thursty King! The world need that Morocco respect the right of selfdetermination of saharawis and stopping the violations of human rights because Western Sahara is the last colony of Africa,says NN.UU since 1963. Thanks you Khalil Asmer for this piece. As a Moroccan (from Tangiers) my heart goles to all Whois suffer humilliation And torture in Western Sahara And in Morocco. Your Voice is going to be heared and your pain is going to be over because day after day the world is becoming more aware of your situation. I just want you to know that NOT all moroccans are hosteges to the expansionism of a rich monarchy that is bringing suffering to our saharawi brothers and puting the moroccan people in a situation of desperation and poverty! One day you will be free and the TRUTH will set us free too! Thank you very much Khalil for this document. As Spanish, I am ashamed of what my country governments have made with the Saharawi people, both then and now. So I hope that some day (as soon as possible) you can held the referendum that you are waiting too many years. Thank you Mohamed maroc. The presence of Moroccans who think and act like you is what we should encourage others to continue to support fair process as the Sahrawi cause. The only thing the spanish here should worry about is the independence of cataluna and maybe the basque country and canarias will follow , ceuta and mellila will be recovered in 20 30 or 40 years.